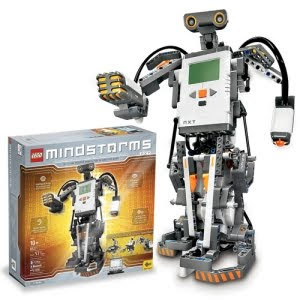 Here's another resource I have, which is the Lego Mindstorms NXT kit/system. It is a robotics Lego set with which you can build and program fairly sophisticated (or simple) robots. It uses the Technic building system, which has beams, axles, and snap-connector pins instead of the studded bricks in the Basic building system. This is the second main Mindstorms version since the old RCX sets (which were yellow and blue). There is a main computer/controller called the NXT Brick, 3 servo motors, and 4 sensors: touch, sound, light, and ultrasonic (distance). I have the first NXT version; v. 2.0 has different Lego pieces for building, a little bit of upgraded software, a color sensor, and another touch sensor in place of the sound sensor. The programming software that comes with the kit is a graphical programming language called NXT-G. The NXT is so useful because it provides a ton of simple possibilities with this one kit. A lot of engineering and design concepts, problems, and projects can be worked out, it's all simplified because it's done with Lego, but still can be very sophisticated, and it's a lot of fun! Just because Lego makes toys for little kids too does not reduce the age range and excitement of this kit. There's so many amazing things that anyone can make with it; just throw it into Youtube to see for yourself.